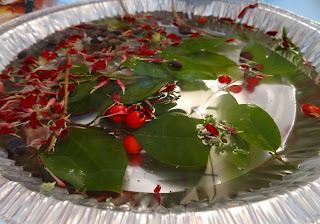 A mandala is defined by Wikipedia as “a spiritual and ritual symbol in Indian religions, representing the universe.” Although usually not associated with Christmas, the general theme is often found in Latvian culture; cycles and circles are of great significance in the traditions celebrated year round. 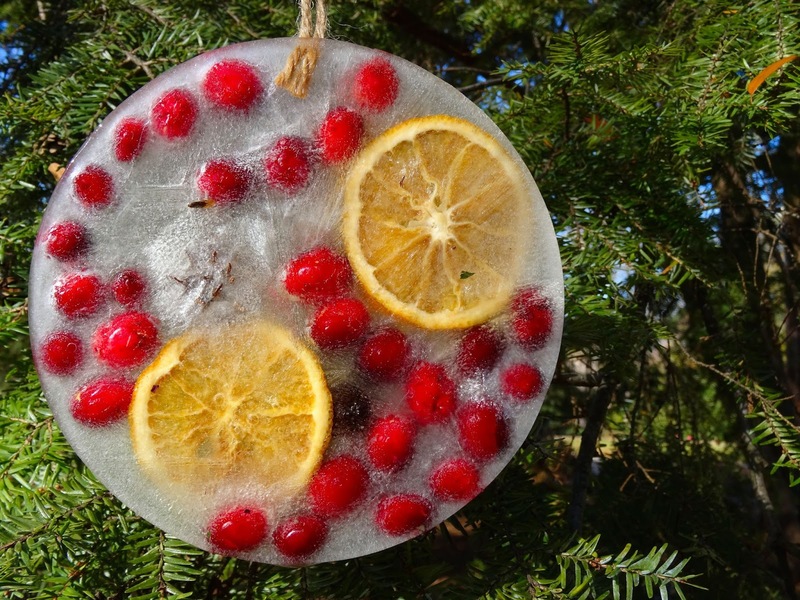 Similarly, decorating with natural materials is a unifying theme behind holiday decorations, and when combining these two elements one aesthetically attractive result is the ice mandala*. 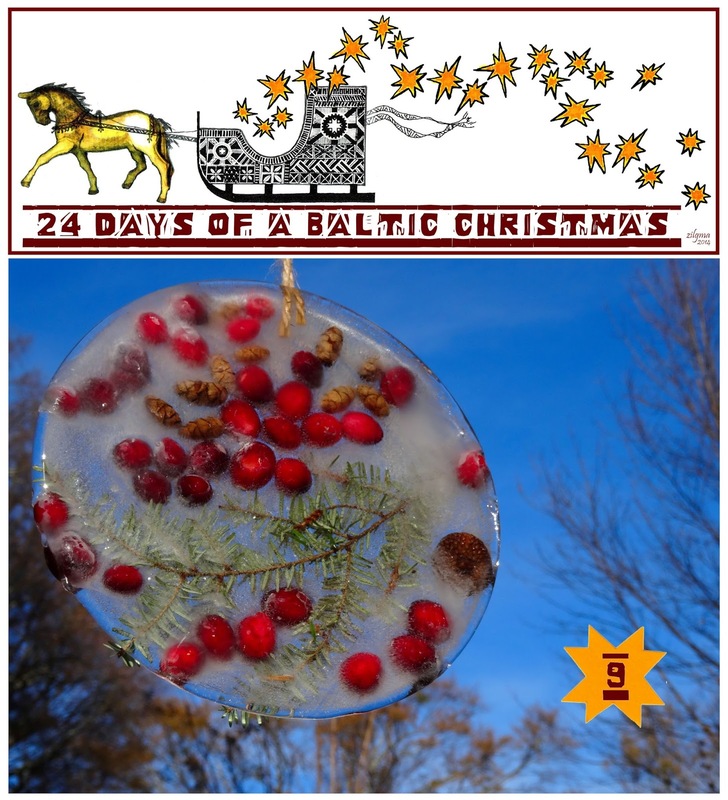 To be fair the making of ice mandalas isn’t Baltic per se, although I imagine that these simplistic decorations are in line with the traditional elements of a Latvian Christmas. More suited to colder climates, the mandalas are easy to make and provide endless variations in theme, color, size and design. 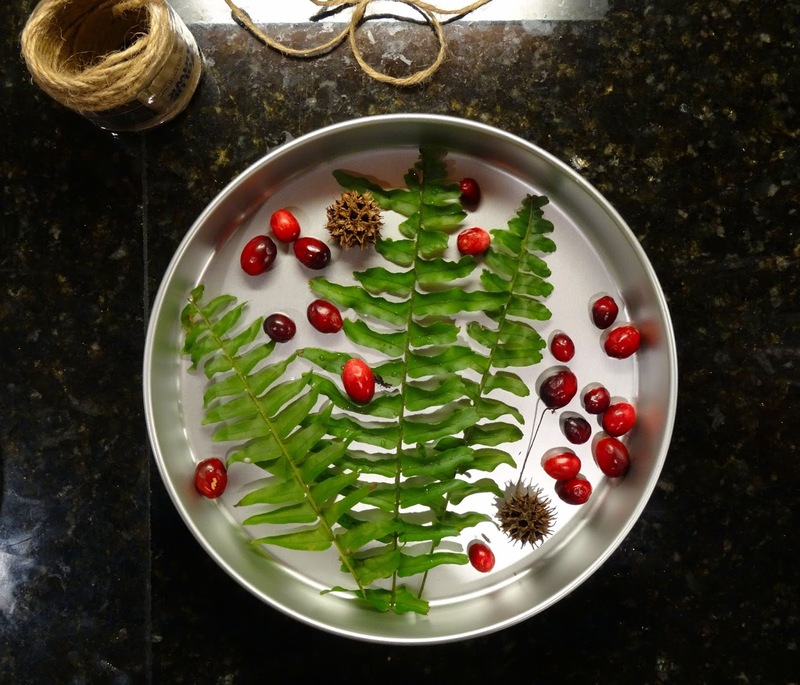 It starts with another hike, the boys picking up leaves, berries, twigs and seeds that strike their fancy. When we get home I sit them down at the table with several circular containers and they arrange their favorites until they are satisfied with the result. 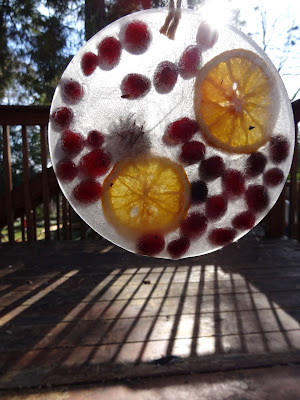 Of course you don’t really have to leave the house, you could instead use some of your dried orange slices and cranberries along with a branch or two you didn’t utilize in making your wreath. Cut a piece of twine and tape the edges on the side of your container so that a loop is formed. This will be how you hang your finished product. 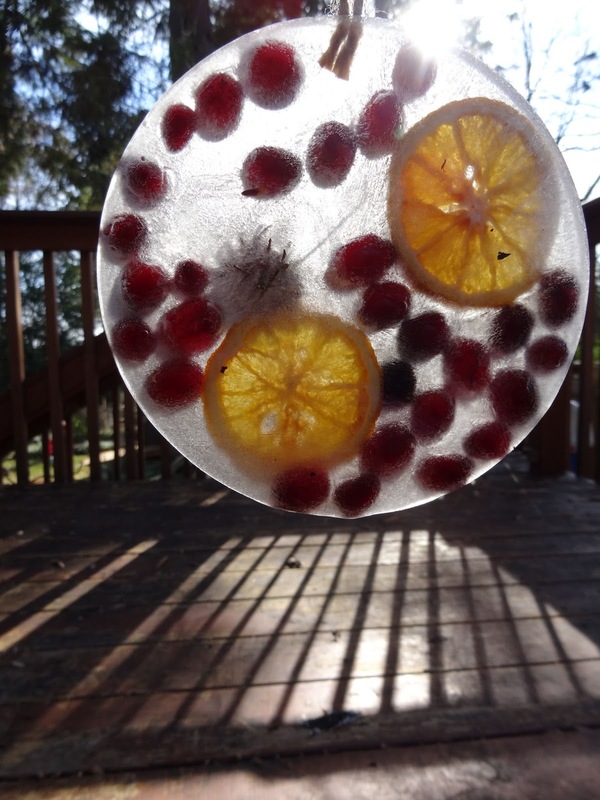 Slowly pour in a layer of water. If your objects float it may be desirable to initially pour in only a bit of water, freeze it anchoring the contents in place, and then adding more water until satisfied with the depth. There are dozens of articles on how to achieve “clear ice,” but I have never really been bothered by the opacity of our mandalas and so I haven’t gotten around to reading them. I’ll leave the research up to you, if you find it important. We stick our cake tins and bowls in the freezer overnight, although those of you in colder climates can leave them outside for a more ‘natural’ result. When ready to enjoy, just run the underside of the container under cool water (warm and hot water will often crack thin sections) and remove the tape holding your twine in place. 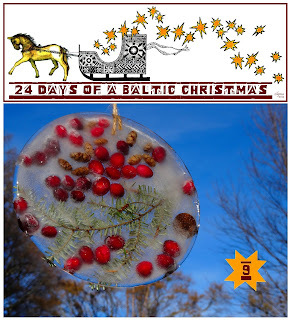 Maybe not a microcosm of the universe, the ice mandala is a microcosm of a Baltic Christmas with a simple, natural charm that provides color, motion and light to your holidays. 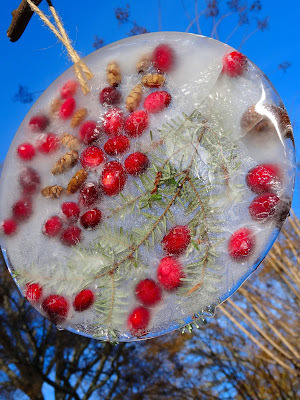 * Although these decorations can be found in many places on the internet, in only one did I see them termed 'ice mandalas.' However, I think it is a lovely name and quite approriate for this craft! 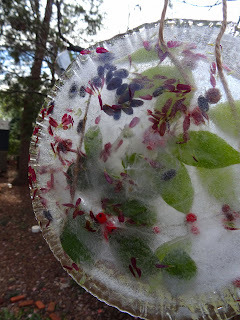 For GardenMama's version please see her posts Ice Mandalas (2010) and Ice Mandalas (2011). what a cool (ha-ha) idea! Wow!! !what a mixed(mandala) traditional idea! !